The Birth of a Nation (1915) and Intolerance (1916), both directed by D.W. Giffith are among the first films that specifically used costumes to create the illusion of an earlier time. 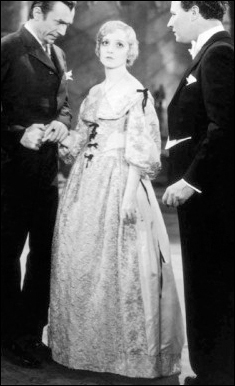 Prior to these films, suggesting period dress was not considered. Actors frequently wore clothing from their personal wardrobes regardless of its accuracy for the period or their characters…Costumes played an important part in these pictures, but they were still primarily the responsibility of the director and actors. It was not until the 1920s, with the formation of large studios in Hollywood, that costume design became a specialized task. Studios began to maintain large costume departments with skilled staff that worked exclusively on costume pictures. This dress is not only one of the earliest documented reuses of film costumes, but it also originated in the silent era. 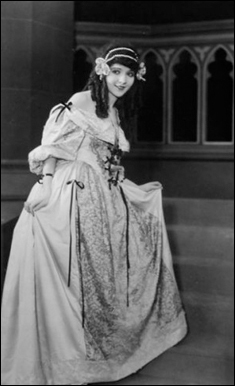 It was worn both times on the actress Madge Shelton, first in the 1922 silent production of Lorna Doone, where she played the title character. Ten years later in 1932 she wore it in the film White Zombie (considered the first full length Zombie film) as the character Madeline Short Parker.